Kaya is a culmin and lives in a world where the cold has the upper hand in most months of the year. Culmins are expected to marry young, so they can start the next chapter in their lives, conceiving children. Kaya's mother has been pushing her daughter to find a suitable husband and this gets on Kaya's nerves. Many years ago Kaya promised her aunt never to marry a hunter. Hunters go out into the woods to hunt for meat, so that the people in town have enough food during the harsh cold months. Kaya doesn't want to be alone for long periods of time and worry about the dangers the hunters encounter when they're out. Who will be able to melt Kaya's heart? Kaya receives small thoughtful surprises from someone who knows her well. The notes that accompany them are signed by her secret friend. Kaya suspects it's one of the young men who work behind the store where she has a job, but she doesn't know for sure. Every morning when she gets to work a fire is already blazing and this helps Kaya against the cold outside. Kaya is stubborn and doesn't have great examples when it comes to love and marriage. She decides that she'll marry her secret friend because he's so kind and caring, but there's someone she can't help but admire. Can Kaya tell her heart who to love or does fate have other plans for her? Paragons are gifted immortals, who live in their own separate world. Every Paragon has an emotion that is theirs to spread. A Paragon notices Kaya and wants to help her find true love, will this be what she needs to finally give her heart to someone? 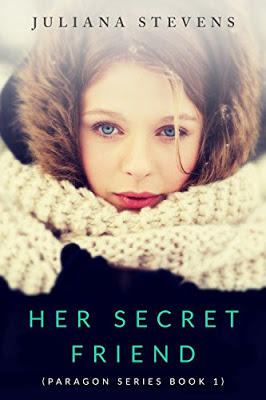 Her Secret Friend is a sweet and heartwarming story about real love combined with the magical touch of Paragons. I loved this angle. Kaya sometimes needs a bit or even a lot of persuasion, so she can be open to the truth inside her heart. She tries to unravel the mystery of her secret friend, but isn't terribly successful and it seems like patience is the only way to discover who's behind the wonderful thoughtful gifts. Kaya is a fierce young woman who deserves to be treasured and I was hoping for her to find the all consuming love she is wishing for. I love to read about people who are making the best of the cards they were dealt in life and this is exactly what the culmin are doing. They make sure they have the right clothes, so they can keep out the cold as much as possible and they all have their own skills to create things that are useful during the difficult months. Juliana Stevens surprised me with her world building skills and unique and refreshing look on how emotions work. I love stories about true love and while I was reading Her Secret Friend I had a constant smile on my face. I can't wait to read the next book in the Paragon series. Charity is a Paragon and happiness is her speciality. When she gets involved in someone’s life, it becomes a lot better because of her efforts to change negative feelings into pure joy. Only other Paragons can see her, she's an immortal with special powers that nobody's supposed to notice, but when she receives a unique case all the rules seem to change. Keith is so unhappy that he doesn’t even have an aura. Charity wants to bring it back, but Keith resists her efforts, which is something she's never encountered before. Will she be able to succeed and make Keith's life better eventually? Keith doesn’t want happiness, he works hard and that’s all he does. For Keith Charity is a nuisance, even when he can't see her he can feel something is happening and he doesn't want what she has to offer. When her efforts don’t work she has to raise her game and that is when she becomes visible for him. Charity gets several weeks to do the job, while normally it only takes a short visit to make someone happy again. What will happen during this time and is there a chance Keith will let her in eventually? When Two Worlds Collide is an original romantic story. 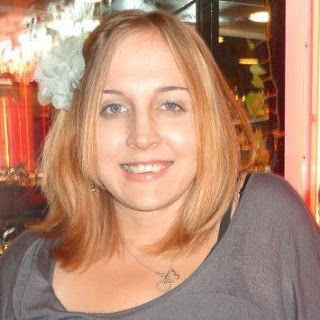 I loved Charity’s sweet and bubbly personality. She’s the personification of happiness. Keith needs help, he’s lost the will to have fun and enjoy life. Charity can’t bring this back as easily as she normally can and she accepts the challenge. This brings all kinds of complications and as she’s never done this before, she and Keith have to find a way to make being in each other’s presence work, which is a fabulous idea for a story. I was really curious to find out where their constant game of pushing and pulling would lead and read their story in one sitting. Juliana Stevens writes about an interesting world, a house filled with Paragons that each help the subjects they are following with their emotions. I liked that topic a lot, it’s creative and the execution is fun and charming. Juliana Stevens understands the core of each emotion she writes about and combines this with great knowledge of the concept of true love, which is a great mix. The result is a wonderful story that put a big smile on my face. 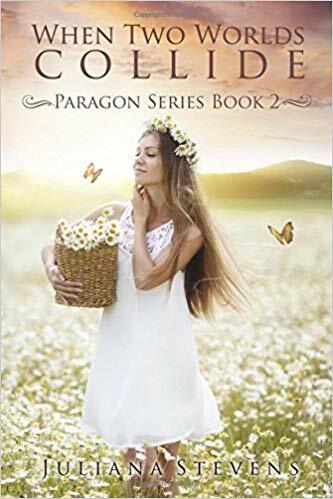 If you love to read stories about finding your soul mate combined with a touch of magic, the Paragon Series would be a perfect choice. The books can easily be read as standalones. One very lucky reader of With Love for Books will receive a $15 Amazon gift card and digital copies of Her Secret Friend and When Two Worlds Collide by Juliana Stevens. I thought our heatwave was heavy going but I've just seen the temperatures for tomorrow in Austin, Texas. How do you cope Juliana? Stay cool! Agh! No, I just couldn't handle that at all! Both books sound like heartfelt, romantic fantasies with unique and original settings. Both sound like interesting books, thanks for the review. An interesting and compelling introduction to this world of romantic fantasy for me. Looks like a real good read, can't wait! Your books look so interesting! Thanks so much for the great review and giveaway also. I have already read Her Secret Friend. It is a very interesting book! Thank you! I love your book covers, they are so eye catching! I haven't read a fantasy book for a while, this sounds great. Omg! The cover is gorgeous! I love what she is wearing! It sounds like a very good book! These two worlds sound very different and imaginative! What wonderful books! Great covers too. Thanks for sharing. This sounds a great read and a different type of genre for me. Not sure I want reminding of the cold winter, but at least we don't need to worry about enough food (live near 3 supermarkets lol). Both stories sound charming and magical at same time. I like the idea of a secret friend, secretly observing Kaya from a distance in "Her Secret Friend" and the pushing and pulling game in "When Two Worlds Collide". Thank you for the book review and giveaway. The book sounds great, love reviews! The cover looks very serene and will sure to attract readers! I would like to give thanks for all your really great writings, including Her Secret Friend & When Two Worlds Collide. I wish the best in keeping up the good work in the future.